Is this another restricted book ? Good thing i have a lot of patients & my internal since of time is limitless (or very slow ? )...maybe that's why i'm so slow in getting this all down.. If you have direct introduction from Rinpoche, you can purchase that Shiné and Lhagtong text. If you are serious Dzogchenpa, you will be helped in your search for Dzogchen by other Dzogchenpas here aboard, no doubt about it. How can i know if i'm serious ? Can you ask me some questions ? Do you think i'm a good candidate to be a serious Dzogchen practitioner ? Finding the truth is an individual task and based on insight into ones abilities. See you are on the good way to get emancipated and you have a Teacher. If you understand basic Dzogchen and want to practice it, then you need the introduction into your Mind from your Master. - Guess you are in a Dzogchen Tradition ? So if you can practice Trekchöd, then it will help you te reduce distractions and to get fixed into the saddle. - Are you motivated ? Guess you are in a Dzogchen Tradition ? So no....not in the traditional sense of having a Bon teacher, like you.. I've never discussed Bon with him either...would he qualify as being able to give me D.I , anyways ???? if you can practice Trekchöd, then it will help you te reduce distractions and to get fixed into the saddle. Do i need a lung or blessings first ? Yeah, but the problem is ...i don't know if i "Got It "
If he gave it and you were there or via webcast it counts. f he gave it and you were there or via webcast it counts. Yeh great that you have a teacher, but i don´t know if this Master can give you Dzogchen teachings. In Mustang are indeed also Bönpos as well the other 4 Tibetan Traditions living. We know there Nyingma-Bön weddings, very normal there. If it is your Master then ask him for some advice. He also can help you further on your path in the Dharma. He can advise you also, a competent and qualified Dzogchen Master. But you are also free to look for other options like adviced here aboard. We all have limited time for doing our practice, so we have to be smart with our time schedule. If we would get up 1 hour earlier every day, then you could use this hour for Dharma practice. Personal would i advice you to start in the morning with some Chi exercises (Tsalung Trulkor / Tib.Yoga etc.) combined with Meditation on one object. 30 and 30 minutes only. As 1 object you could use the Tibetan letter A in front of you, 1,50 meter. Technic is looking only undistracted at the A without looking to something else and thinking on something else. This of course is based on discipline and daily practice. If you would start with these simple and easy things you have created for yourself a certain basis and can watch your results. But you have to spent something not money, but time and if it is ok for you then you will be motivated to start with practice. With the practice you can feel emancipation, text confuses sometimes and some are better fit for yoga and meditation then for studying. Maybe you belong to the latter category. Introduction is sufficient for that particular book. 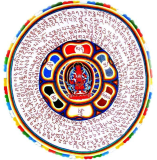 I hereby certify that when buying any RESTRICTED item(s) I have received Direct Introduction from Choegyal Namkhai Norbu, have received the specific lung transmission for any practice materials including mantras, and have attended the retreat (either by webcast or in person) for any retreat mp3 I am purchasing. If you've attended a webcast with explanation and then transmission you should be good. Did you not receive one of those? That’s a basic description of restrictions. DI is all one needs for the Shine and Lhagtong book and many others. It says: "...have received the specific lung transmission for any practice materials including mantras." This book doesn't include mantras. If you have D.I., you're good to go. If in doubt, e-mail them and ask. There's not much to figure out, it seems. You are able to purchase that book. It will provide you with a very clear understanding of how to bring whatever familiarity you already have with shamatha and vippassana on to the Dzogchen path. Even if you don't think you 'got it' this book will help you discover precisely what methods to apply until you 'get it' - until you can have confidence in distinguishing mind from the nature of mind and discover how to align your practices towards that . So if you want to 'get it', then the only geting to do is the getting of the teachings in that book! If you don't mind e-books you can purchase a digital copy much sooner. There are other books you can purchase too but I think for now this particular book is very straight forward and clear. In the future, you can also email them to see what other books you can read with the D.I alone but maybe by then Rinpoche will have given some more rlungs. - Your reasoning and your vision about illusion. - In how far do you see illusion as "realistic"?" I don't have any credentials in Dzogchen but I can say what works for me - 53 years after entering the golden temple of Lord Buddha in Freewood Acres, NJ. It is (permanence), it isn't (nihilism), neither, or both, are the 4 philosophical strayings. If you need a philosophical base to hang your consciousness on, then accepting the 4 strayings works to quickly end the need for further thought (explanations). If ever you are claiming one of these 4 positions, you are straying from the truth (what works to rest your mind) and you may get a philosophical headache because there are no end to lengthy explanations justifying one position or another. Far easier to me (a tired old guy) just to lump these 4 views together and go back to sleep (contemplation). Tsel dang and rolpa, the three ways that things can appear to the consciousness, are a more experiential explanation. If you search on tsel dang rolpa (above) you may find some helpful explanations. If you allow "energy" to equate to "how things appear to consciousness" the meaning of the three examples becomes clearer. No end to words (thought forms) - no end to the arising of pure from the beginning and spontaneously arising words. So all words are permanent - not illusion - if flavored by, informed by, non-dual contemplation. All words are empty - total illusion - if flavored by - informed by, non-dual contemplation. Now you understand why "neither" and "both" are also necessary and completely correct when flavored by - informed by non-dual contemplation. - In how far do you see illusion as "realistic"? thanks to all my imaginary friends..
Long time ago, how are you doing ? The last example shows the finally correct vision about illusion imo., because it shows that in non-dual Dzogchen practice objects are seen as empty. I would replace illusion here with reality, what do you think ? Is it possible to see or experience anything that is not illusion? Yes in our State of dualism. Usually, objects of awareness are illusion. But awareness itself cannot be refuted. Even if you argue, "all of this might simply be a dream"
there is awareness of that.